Open up a .ppt file and go to File | Check for Issues | Inspect Document (I’m doing this in Office 2010, I know it also works in Office 2007). 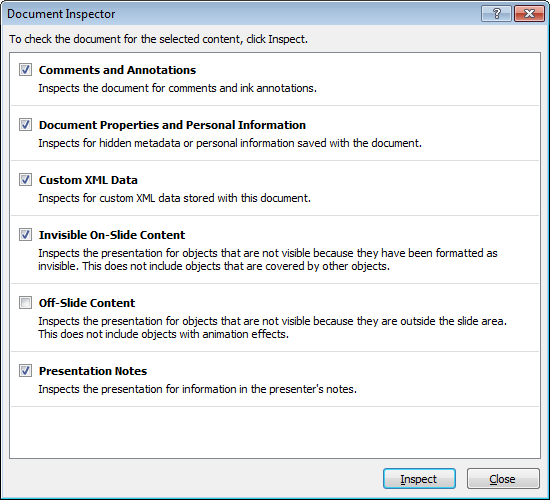 The Document Inspector window will open (below) and voilà, you can inspect the Presentation Notes. Now, you can also look for comments, check for hidden metadata, you can even look for XML! I don’t want XML in my database, I certainly don’t want it in my PowerPoint. 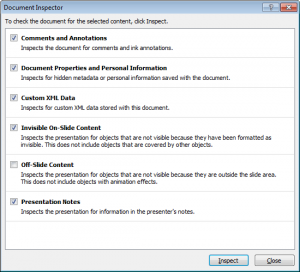 But anyway, check or un-check whatever options you like, but leave Presentation Notes checked and then select Inspect. If it finds any text in the notes section it will tell you, and then you have the option to Remove All. Just like that. No more highlight and delete for me! The only drawback I have found is the instance where I have included links in the notes that are relevant to the content. But perhaps I should get with 2011 and start including those links in the slide. Hope this helps! A good tip and it applies far beyond PowerPoint. It surprising what people forget when they distribute a Word document with tracked changes and complete properties. Word has a “Prepare for Sharing” feature that should be used to help avoid those issues.